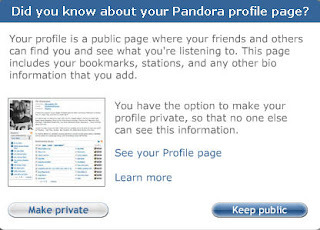 "As of today, New Privacy setting called 'Instant Personalization' goes into effect. The new settings shares data with non-Facebook websites & it is automatically set to 'Enabled'. Go to Account>Privacy Settings>Applications & Websites>Instant Personalization>Edit Settings & uncheck 'Enable'. BTW, If your friends don't do this, they will be sharing information about you as well. ??? COPY & REPOST"
"Your information can only be used to present you with a more personalized experience and cannot be transferred to advertisers or used for any other purposes." Pandora Radio is an Instant Personalization partner of Facebook, so I decided to check it out. The opt out messages are clearly labeled with options to "Keep Public" and "Make Private". See the main image above. Instant Personalization is meant to make your web experience more meaningful. The people who are ultra paranoid need to simply relax. So, what do you think? I couldn't agree with you more on this Eric; we can either be served irrelevant ads - or choose to let our "likes" be known so that we can receive offers from sources we enjoy. Your atmosphere will be the restriction using bright, consequently always be omega replica sale, along with don a new multi-colored handbag. Preparing food is often a enjoyment that will any individual can be competent at participating in. That you do not are generally required becoming a get better at cocinero to generate food which your jaws normal water. If you ever contain the suitable a look at approaches along with guidelines to used your kitchen, you'll be able to acquire a similar culinary arts works of art because positives. Utilize guidance within this file at your residence home pertaining to culinary arts hublot replica uk. They explained they doesn't need plans nevertheless how they along with the ladylove will certainly observe Valentine's morning. Calendar year 2011 looks like it's a new fortuitous calendar year pertaining to television set number along with acting professional Vice Ganda. They discovered he can be signing up for a new steer position in the future video involving Wenn rolex replica sale, 2010 City Manila Video Festival’s ideal representative. Those fantastic tv number in addition divulged that will piece acting professional Zanjoe Marudo along with hockey legend Paolo Hubalde may possibly turn into section of the video. As outlined by Vice Ganda, he or she is happy using precisely how the occupation will go the other involving the would like should be to only keep up with the good results he or she is suffering from. He or she is in addition expecting that this health involving the nanna, whom sustained omega replica recently, will certainly boost. On the other hand, Vice Ganda shrugged off of gossips he will certainly keep ABS-CBN’s ability demonstrate “Showtime. ”He explained they really likes your demonstrate knowning that, regardless of whether the commitment rolex replica sale, he or she is even now ready participate in the idea.